Bullet journal habit trackers are one of the best ways to build good habits and stay accountable to your goals. In this post, learn what habit trackers are, how they can improve your bullet journal, and 51 ideas for habits to track. Do you use habit trackers in your bullet journal? 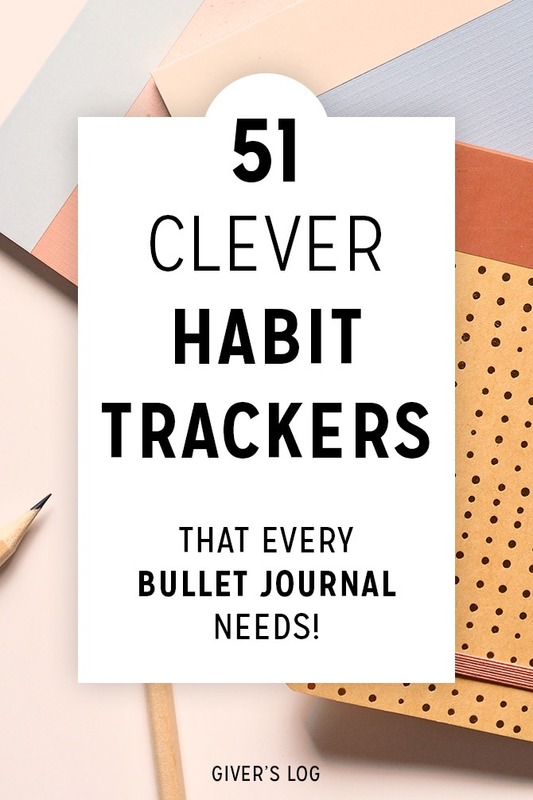 Whether this is your first time setting up a bullet journal, or you’ve been a #bujoaddict for a while now, I hope you’ll find something useful in this post about 51 clever bullet journal habit tracker ideas. Using a habit tracker in your bullet journal can help you make progress toward all sorts of goals! You can use a habit tracker to establish good habits and help you break bad habits. I like to use a simple habit tracker to record my activities throughout the day, week, and month as I keep an eye on progress toward my goals. You can use a bullet journal habit tracker to record any number of things. You can track simple habits – like drinking 8 glasses of water daily. And, you can track long term health goals like weight loss, or building the habit of daily exercise. 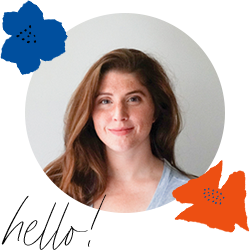 You may be wondering, why make a habit tracker in the first place? And I understand that! When I first started bullet journaling, habit trackers looked like busy work to me. But, I soon found out that there is a huge benefit in recording whether or not you do something in your daily routine. The benefit of filling out a habit tracker is learning more about yourself. Are you doing certain tasks consistently? Do you think you’re doing something everyday — but in reality only doing it occasionally? Do you think you are making more/less progress toward a goal then you are? Recording your habits in a bullet journal tracker makes you accountable to yourself. If you are using a bullet journal for productivity, organization, or personal development, the information in your habit trackers will be so helpful! You can use what you learn to establish new patterns that improve your lifestyle. Habit trackers also allow you to look back over several months and see how you’ve grown over time. Using a habit tracker helps motivate you to make small changes every day — which can lead to big results over time. So go on! Give a habit tracker a try in your next weekly or monthly spread. It will remind you to stick to your goals and build good habits. Then you’ll see how those baby steps can turn into concrete progress. And as you build those habits, they’ll soon be “second nature”. The beauty of the habit tracker is it’s flexibility — you can literally track anything! The rules are up to you. You can track any number of habits you want. And you can track them on a weekly, monthly, or even yearly basis. Some habits you’ll want to track in a daily format — like drinking enough water, or getting enough sleep. And some habits — like remembering to water the plants — you’ll want to track on a weekly basis. And finally, some habits — like paying bills — you’ll want to track on a monthly basis. To set up a super simple daily habit tracker, all you need to do is set up a grid with a column for each day and a row for each habit you want to track. For example, if you’re staring in January, you’ll have 31 empty columns labeled 1-31. And you’ll have 1-10+ empty rows underneath, each labeled with the habit you want to track. To fill out your habit tracker, simply place a check-mark, an “x”, or fill in the box indicating that you completed the habit on each day. Some people like to use separate colors for each habit — which looks really cool! Setting up a habit tracker in your bullet journal is pretty easy, but you might need a little help brainstorming what habits to track. Drink water — Track to make sure you stay hydrated. Get enough sleep — Set a goal for how many hours of sleep each night. No electronics one hour before bed — Experts say this is helpful for people who have trouble falling asleep. Get to work/school on time — It is a personal goal of mine to be more punctual! Meet calorie goals — This can be useful if you are trying to live healthier. No junk food — This doesn’t have to be all junk food, you can make it anything you want. 10,000 steps — This is useful if you track your steps. Cook at home — Cooking at home can be a great way to eat healthier and save money. Eat healthy breakfast — I have a tendency to skip breakfast, so this could be a good habit for me to track. No cigarettes — This could help build momentum to help you quit. Use bullet journal. So meta. Read a book. — Maybe you want to set goal to read 15 minutes each day. Gratitude journal. — I like to list 3-5 things each day. Meet in person with a friend or family member. Phone call to parents, family member, or friend. Check off the to-do list. Spend less than x amount of time on social media. Watch less than x amount of TV or Netflix. Quick tidy of the house. Make progress on a school/work project. Publish a new blog post. Habit trackers can come in all shapes and sizes. The most popular design is probably the “spreadsheet-style” monthly tacker. But more and more I’m seeing really creative circle habit trackers, and cute mini habit trackers. Here’s a few of my favorites and why they work so well. If you’d like to learn more about bullet journaling, check out my ultimate Bullet Journal Setup Guide. And don’t miss these awesome Bullet Journal Key Ideas. Pin this to your Bullet Journal Board on Pinterest!